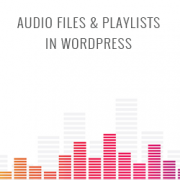 Do you want to add audio files to your WordPress site? As a content management system, WordPress is capable of handling audio files by default. However, many beginners are not aware of this. 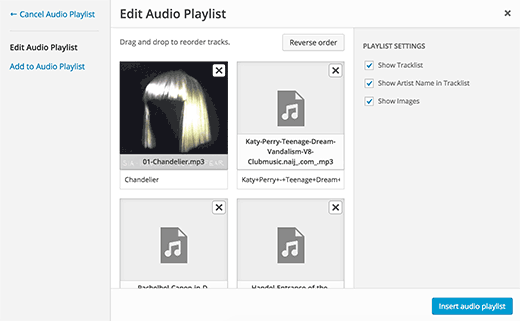 In this article, we will show you how to add audio files and create playlists in WordPress. WordPress uses HTML5 audio tag to embed audio files. It is compatible with most modern devices and works particularly well for mobile devices. 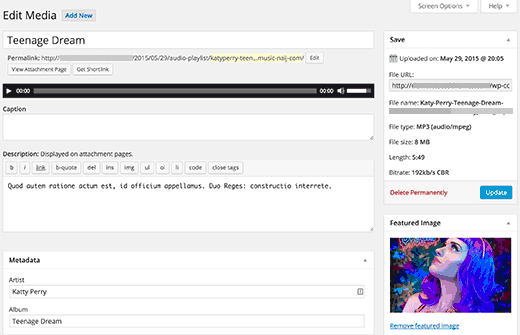 HTML5 audio tag supports MP3, OGG, and WAV file formats. MP3 is the most commonly used and widely supported format for audio files, and we recommend you to use it whenever possible. Adding a single audio file or music track to any WordPress post or page is very easy. Simply click on the add media button on the post edit screen. Next, a media uploader popup will appear on your screen. You need to click on the upload file button to select and upload your audio file. Once it’s uploaded, you need to click on insert into post button. You can continue editing your post, or save and publish it. Once published, you can preview your post where you will see your audio file embedded like this. 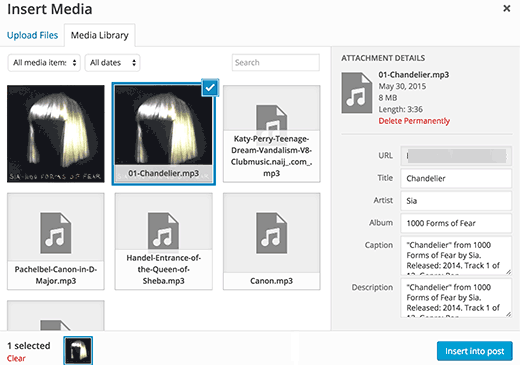 Another easier way to add a single audio file is to upload the file to the media library. After that simply copy the file URL and paste it in the visual editor. WordPress will automatically embed the URL for you. This is similar to how you embed videos in WordPress where you just paste the URL of a YouTube video and WordPress automatically embeds it. 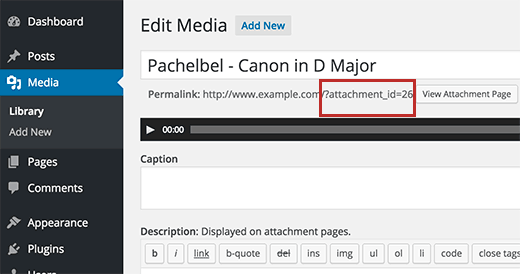 Just like image galleries, you can also add audio playlists to your WordPress posts using the media uploader. Simply click on the add media button to upload your audio files. After uploading your audio files, you need to select the files you want to include in the playlist and then click on create new playlist link in the left hand column. You can now drag and drop to rearrange songs in the playlist. You can also enable the display of track name, artist name, and image. This information is embedded with your MP3 file’s IDT meta tags and is automatically displayed by WordPress. Once you are done, simply click on the insert audio playlist button. Your playlist will be added to your post, and you will be able to see it in visual editor. You can now save your post and preview your playlist. WordPress can automatically get the meta information from your MP3 file. However, if your file does not have any meta information, or you would like to change it, then you can do so in the media uploader. Click on the Add Media button to launch the media uploader. You can upload your audio file or if you have already uploaded the audio file, then click on it in the Media Library. Once the audio file is selected, you will notice the attachment details column on the right. This is where you can provide track title, artist name, album name, caption and short description for the track. This information will be displayed in the playlists and on single attachment pages. If the audio file you uploaded has an embedded image to be used as album cover, then this image will be automatically extracted by WordPress. It will be stored in your media library and will be used when this track is added to a playlist. 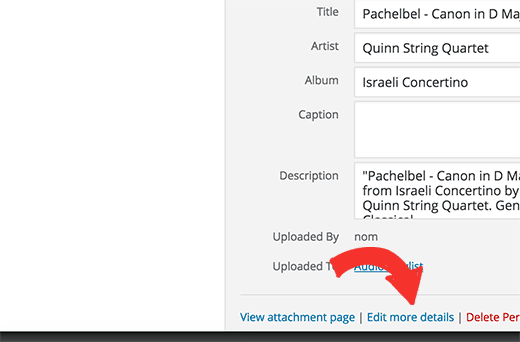 However, if your audio file does not have a cover image, then you can edit the file in WordPress and upload an image. Simply go to Media » Library select the file you want to edit and click on the edit link below it. If you are viewing the media library in grid view, then clicking on the audio file will open a popup. You can click on the Edit more details link at the bottom of the popup to edit the file. You will now reach the edit media page, where you can not only edit all the meta information for your audio file, but you can also upload a featured image. This image will then be used when the audio file is added to a playlist. By default WordPress does not automatically embeds audio file URLs. First we need to enable automatic embedding for text widgets, and then we need to enable shortcodes. Simply paste this code in your theme’s functions.php file or a site-specific plugin. Now you can upload a file to the media library and copy its URL. Add a text widget to WordPress sidebar and paste the URL inside it. To add a playlist, you will need to use shortcode [playlist] with the IDs of media files you want to include into the playlist. First you will need to upload the audio files you want to include in the playlist by visiting Media » Add New. Now you need to edit each audio file you want to add in the playlist. Simply click on the edit link below the file in media library or click on edit more details link if you are viewing media library in the grid view. On the Edit Media page, you will get the media file ID below the title field. 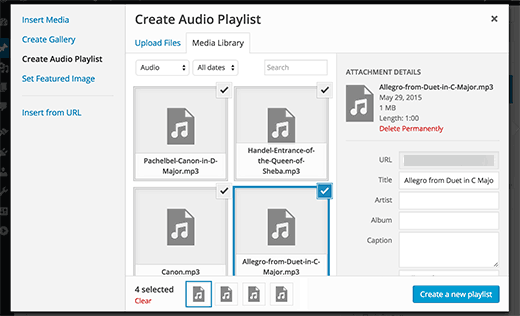 We hope this article helped you learn how to add audio files and create playlists in WordPress. You may also want to take a look at our guide on how to start a podcast with WordPress. I’ve done all this but my files don’t show attachment_id. its just the file name as i’ve saved it. what i was hoping to do was to have a page with lecture notes by topic and this doesn’t seem to work. any ideas or am i doing it wrong. no issues adding to the functions.php but i haven’t added a text widget because i don’t want to see the widget on every page. I am able to insert an audio file into a post using your above method. It is in a Wav format. However, the audio file will not play in preview. Do I have to actually publish the post for the audio to play? Hello, I figured out how to add the audio file to both, a post and Footer 1, I actually like it better at the bottom of the page, it was pretty easy to upload, it’s about 3 minutes of a song, however, like your photo above it shows 00:00 and I published it and when i press play, it wont? help? Also, this is my first site, so I haven’t launched it yet, does that have anything to do with it? Also can i make it play automatically whenever someone visits the site? I keep following this method to add my audio but it only becomes available as a download and can’t actually be played on my site. Can you tell me why this is? Hey, there! I’m an author who is trying to add a short audio recording of my book under each description. I’ve followed the tutorial but the audio player doesn’t pop up. Instead the link just becomes downloadable. Your audio clip needs to be in supported format MP3, OGG, and WAV file formats. Great tutorial. Followed it to a “T,” however, files will not load. The files are compatible as they are MP3, and they worked back when I started up my website. Now there is a 2MB limit. Any ideas? All songs are longer than 2MB. It will work in a post, but not as this suggests in a media library. I have not tried a widget playlist as I thought it would do the same. Have tried from both URL and selecting files, but as stated the limit prevents me from adding anything. TIA. You can increase the maximum file upload limit in WordPress. I need to add a playlist to my website. I am a DJ and need to have brides and friends access playlist and put songs and artists as well as be able to add MP3 files on the list if needed. I need it to be specifically accessible to each party separately. I am not sure which plug in is best. I use WordPress regularly for my website. Can you advise? What size should the photo be set to so you can see it with correct aspect ratio? It’s only showing me the top 1/3 to 1/2 of my photo. I have a blog with a considerable number of visitors and would like to make available an audio version of the posts, that is, all the posts would be reproduced, also, in audio. My question is whether this could be characterized in duplicate content for Google. Very good tutorial but i want to know if it is possible to add “download” button on single song and how. I got watched many tutorials on how to add audio and create playlist but I can’t find a tutorial/lesson on how to add download option in the playlist. I want to create a playlist as a widget, but the permalinks for my audio files are showing as the artist/song names, not as attachment ids with numbers. Therefore when I want to create a playlist made up of song ids, I’m not sure how to do that. Is there a way to change this or get the id that I’m not seeing? I host a weekly radio show. For the time being I am using HTML tables to create my playlist. Is there an easier less time consuming way to do this? My radio shows are on my hosting site in mp3 format. Any ideas would be greatly appreciated!! I use Google sheets to write out my playlist for a given show and then use the online tool tableizer to convert the text to table. Then I take that code and paste it to my WordPress page. I go through a lot of steps and would love to simplify this process. The instructions mentioned above will help you create a playlist in WordPress itself. 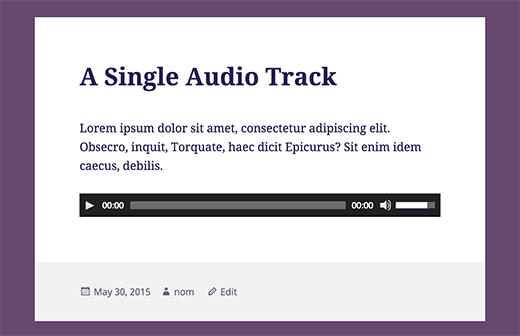 You can also check out these audio player plugins for WordPress to make things more simpler. Hello, I’m trying to add an audio playlist (mp3 files) to my homepage in a widget and I’m not able to. I have the Maxwell template. Does this template allow for this function? When I download music files, the “Create Playlist” function doesn’t appear. I’ve also tried installing the Cue plugin, which allows me to put a playlist on a post or a page, but not in a widget on the static homepage. Thanks for any help! Any idea on what could cause music to play when clicked on the download link instead of downloading? i have put the audio file. But, how do i make it downloadable to the public instead of streaming? This tutorial was awesome. The mp3 file works great on my post page. However it doesn’t work on my site when accessed by an android phone or tablet. It does nothing when clicking the start button, any suggestions? Hello, can I display the music with a different appearance? Bigger buttons to manage the songs. Another music theme. is it possible to have one song playing in the entire website, that doesn’t stop and start again the minute I navigate it? Can shared hosting take the load of music playbacks from website? A couple of music files not accessed by many users at once will be fine. However, if you are getting many visitors and have multiple music files, then you will need to upgrade your hosting to managed WordPress hosting. Does your theme shows sidebars and widgets on smaller screens? 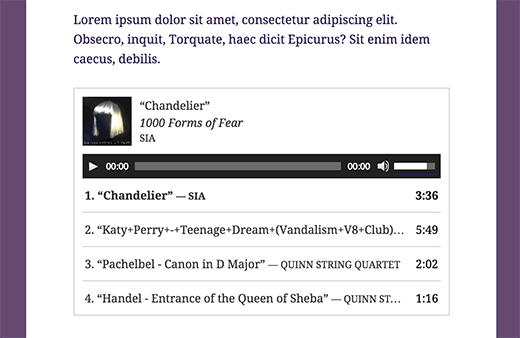 Yes of course you can embed an audiobook on your WordPress site. Thanks – is it possible to add video files to a free version of WordPress? Using the theme Twenty Thirteen. …or embedding links to ‘audioboo’ – an audio recording platform in the free version of WordPress….?? Not an audiobook – although that sounds cool!!! Is there a way to share this audio on social media such as Facebook or Twitter, etc? I’m never listening to what WP Beginner says again. I was trying to add a code for different music player as the one I have doesn’t do playlists. It says WordPress can do it itself, so I added what it said where it said and the following happened. Just copy and paste that code into the functions.php you said. Great, THANK YOU VERY MUCH. Please see our guide on how to fix syntax error in WordPress. You may also want to see our beginner’s guide on how to copy paste code in WordPress. The error you are seeing indicates that in your WordPress functions there is an unclosed statement before add_filter at line 365. Probably just a missing semi colon. You can easily fix that by editing your functions file using an FTP client or file manager in your hosting control panel. I just tried to add 4 audio files to the media library for our site and was refused. It gave a list of acceptable file types, none of which is audio. I created this audio play list. Love it. They are fine on website. BUT just found out that they keep looping the first section of audio files when playing on ipad and iphone. Please guide. Is there a way to create a Playlist using external (remote) mp3 files? I know how to embed the audio player for one song, and then edit it to provide both an mp3 and an ogg file so that the right one plays based on the visitor’s browser. Does anyone know if that’s doable when you’re creating a playlist? I can’t seem to find whether that’s possible or not, and how to do it. Is there a way to have the mp3 set to autoplay and to loop when the page is uploaded? Thanks. How can i add one playlist from own map of my sites ftp, not via media upload to wp? how can i play one map, how is link? So I’d like to know if you have an idea how to make the audio files downloadable, probably to insert a download button along the playlist for each track? It seems that every time I create a playlist, the audio files can be easily downloaded by users. In the video, it appears that the songs are not downloadable by the viewer. Could someone offer assistance in making these audio files non-downloadable? The playlist shows on the website’s page not with the possibility to play it but download it. Hi, I have definitely used this approach in the past. I am migrating a client from Host Gator to WP Engine and realized they have over 1GB of audio files they are hosting (and streaming of course) on their site. This is a huge bandwidth issue, as you can imagine. Not that the files are access frequently, but it occurred to me that self hosting audio may be just as bad as self hosting video. In the past, I’ve hosted the files on Amazon S3 account instead and used an audio streaming plugin to fetch those files. I think that would be a better solution to avoid download/bandwidth issues on the web host. However, I’m wondering if an even better solution is to host and stream the files via SoundCloud or similar service, then embed the SoundCloud file on the website? I’m trying to assess what is going to allow best performance, reliability, and least bandwidth hit to the WP hosting account. Take Note: anyone trying to do this, shouldn’t copy and paste the ‘play list’, code rather manually retype it to your own website because the quotation mark here seems to produce a False result. Thank You, it works. Sorry about that. I just fixed that formatting issue. Love this tutorial. Thanks for sharing. What about adding a playlist from soundcloud or other media sites like hulkshare and reverbnation?? Any guidance on what audio files you can post and which you shouldn’t for copyright reasons? Even some links would be useful. As a general rule of thumb, you should not upload audio files containing the works that you haven’t created yourself. You can create and upload your own audio files, or the audio files that are currently in public domain. Great post! Thanks you so much! I Have embedded different streaming radios in my site. Selecting them one by one they all play simultaneously. Is it in WordPress a way to automatically close the playing radio on selecting a other one? No, users will have to manually stop and play them. Peter, Ask your host to increase your file size upload limit for WordPress. If they won’t or can’t, and it’s something you really need, you might want to change hosts. For one of my client’s sites on WPEngine, they’ve increased our upload size to 200MB. Once a year, we upload about 10 audio files from a conference, and we needed the additional file size settings because the files are usually of one-hour talks, so they’re larger than just your typical audio song file.